These are almost like chocolate chip cookies…but not. 1. Preheat the oven to 375F. 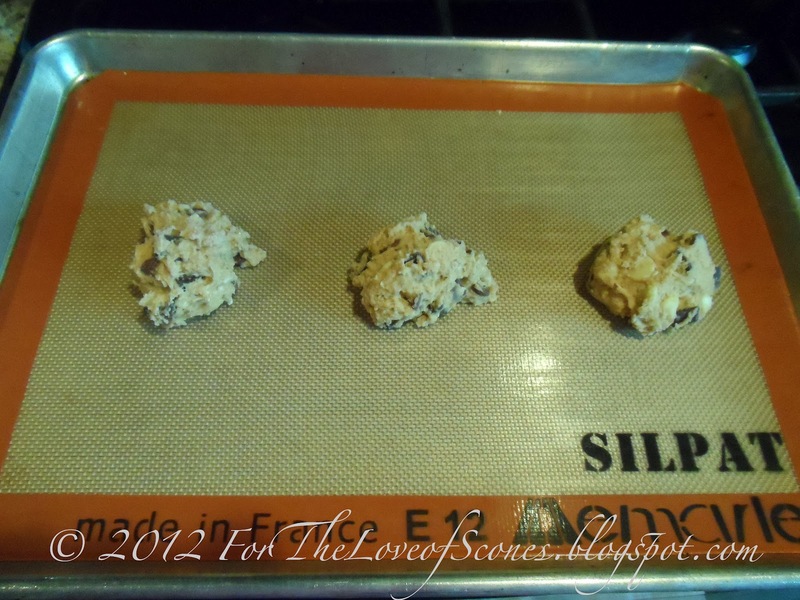 Line a baking sheet with parchment paper, a silicon baking sheet or grease the sheet. 2. 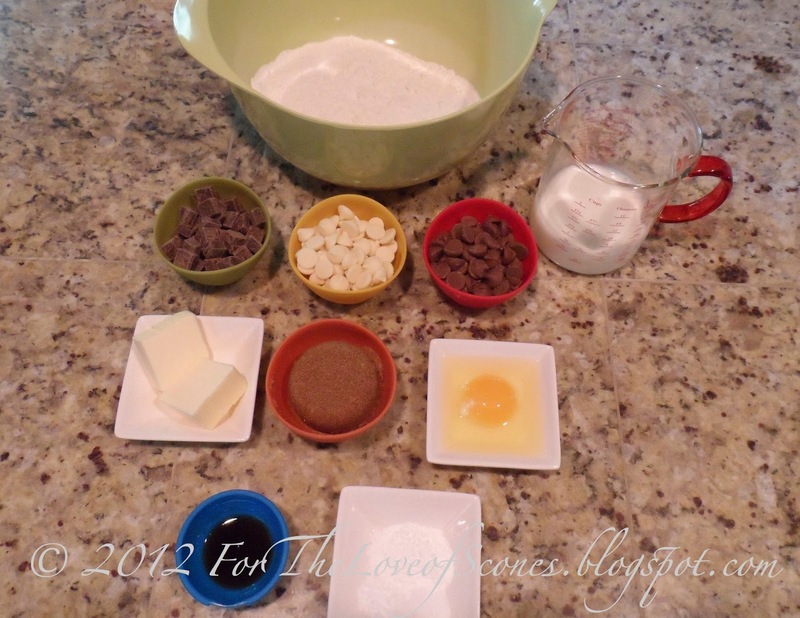 Whisk together the flour, brown sugar, baking powder, baking soda and salt in a large bowl. 3. Add the butter and, using a pastry blender, your fingertips or two knives in scissor fashion, cut into the dry mixture until it looks like coarse sand. 4. In a small bowl, combine the buttermilk, egg and vanilla extract and stir or whisk lightly to combine. 5. 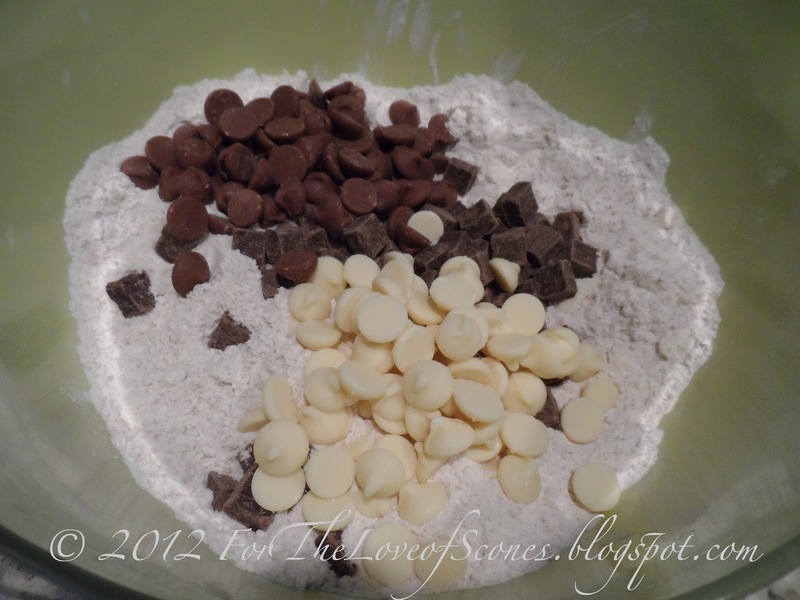 Add the chocolate to the dry mixture and stir to combine. 6. 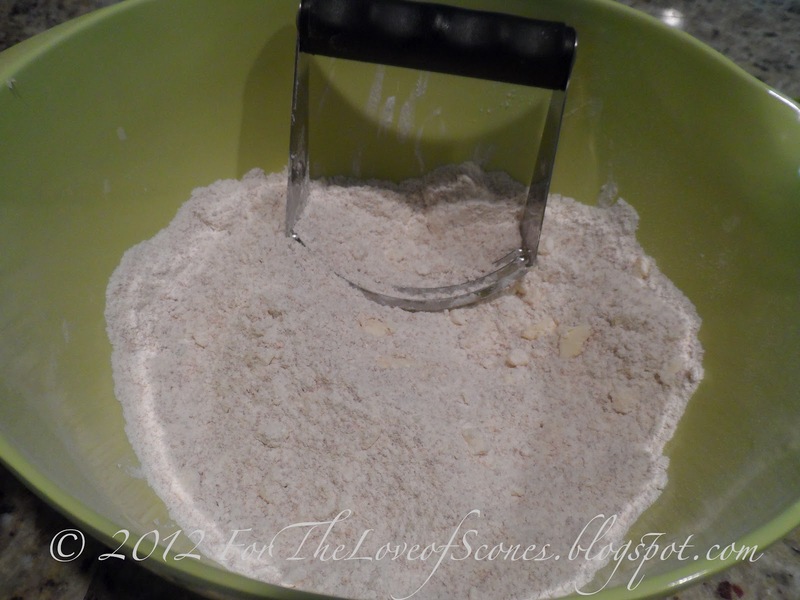 Add the buttermilk mixture to the dry mixture and stir with a wooden spoon until dough forms. 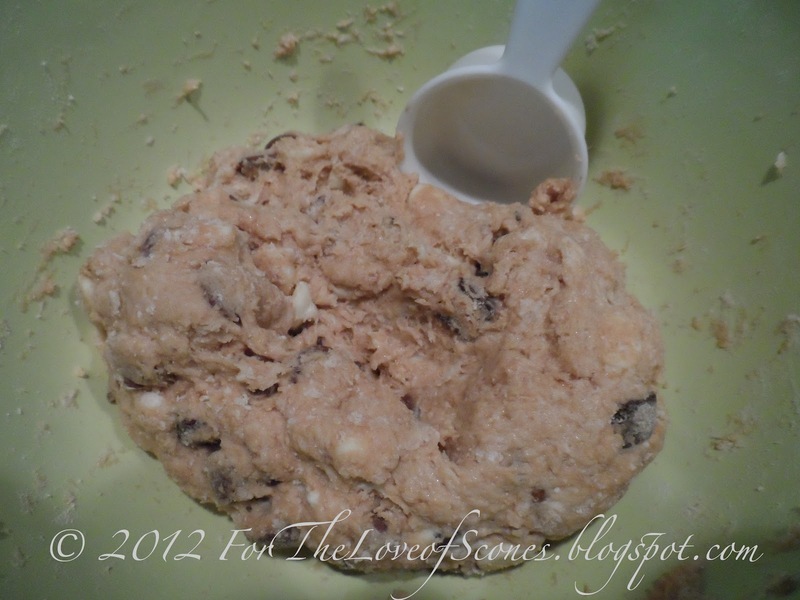 It will look a bit like cookie dough. 7. Using a 1/4-cup measuring cup or a large spoon, separate the dough into 10-12 free-form scones, leaving a couple of inches between each scone. 8. Bake for 20-25 minutes or until lightly browned on top. Serving assumes the above recipe yields 12 scones. Dry mix with butter mixed in. 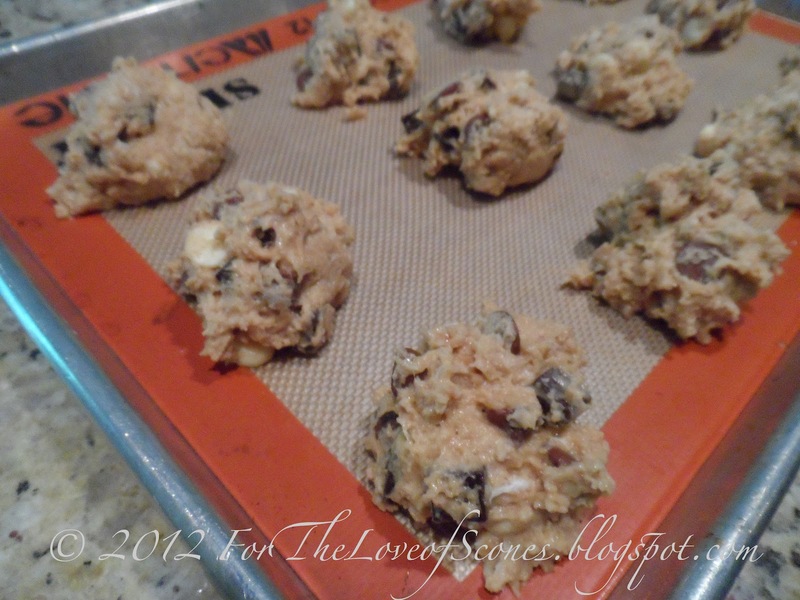 I prefer to add mix-ins like chocolate chips or fruit prior to adding the liquid so that it can be more consistently mixed without making the scones tough. Add the buttermilk mixture and stir to combine. Use a 1/4-cup measuring cup to equally divide these drop scones. I froze my scones at this point because I wasn’t ready to make them, thus my scones are much closer together than I would normally bake them. 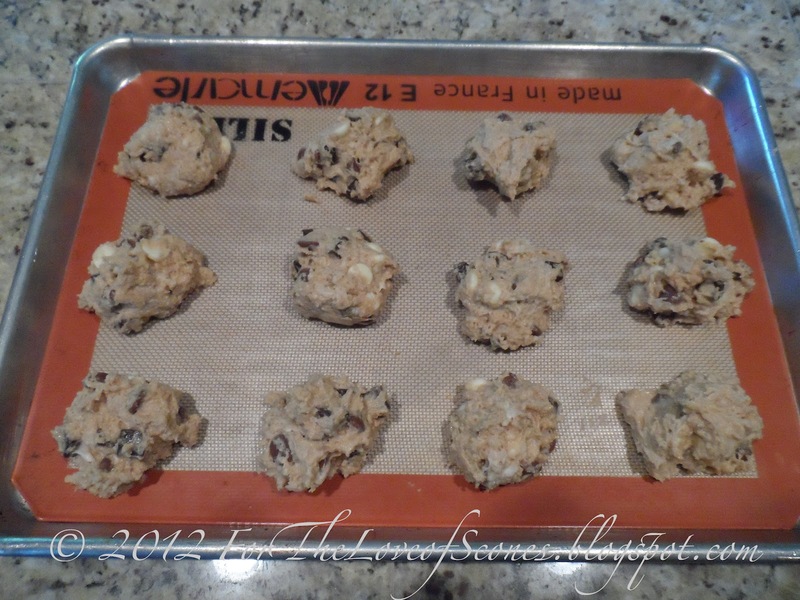 Instead, bake 6-8 to a large baking sheet, making sure they have at least two inches of room between scones. Frozen scones ready to go in the oven. This was a good distance to have between the scones. Frozen scones baked in my oven at 375F in just over 20 minutes. Before I review this recipe at all, I must caveat it with the fact that I don’t care for either milk chocolate or white chocolate, but chose to follow this recipe verbatim anyways. That out of the way, I was a bit disappointed with the flavor of these scones. They were, essentially, glorified chocolate chip cookies, but without either a cookie taste or scone texture. They were not as sweet as chocolate chip cookies, and not as flaky as scones. They really fell flat for me, and I don’t know that I’d make them again. Perhaps if they were only dark chocolate scones, I would have liked them better. I also believe that the chocolate quantity overpowered the scone itself, and I would reduce the amount of chocolate in this recipe if I made it again. I could see children or chocolate lovers appreciating this recipe as it is, so there’s something to be said for that. However, as a cream-scone and traditional-scone lover, who enjoys her scones with coffee or tea in the morning, these felt more like a standalone dessert or something to bake when I’m in the mood for something chocolatey but not as sweet as a chocolate-chip cookie. Perhaps a tall glass of milk would accompany these scones better than coffee or tea. But then, that doesn’t seem much like a scone, does it?